Perfect Bib by Toppy Toddler #Review and #Giveaway! 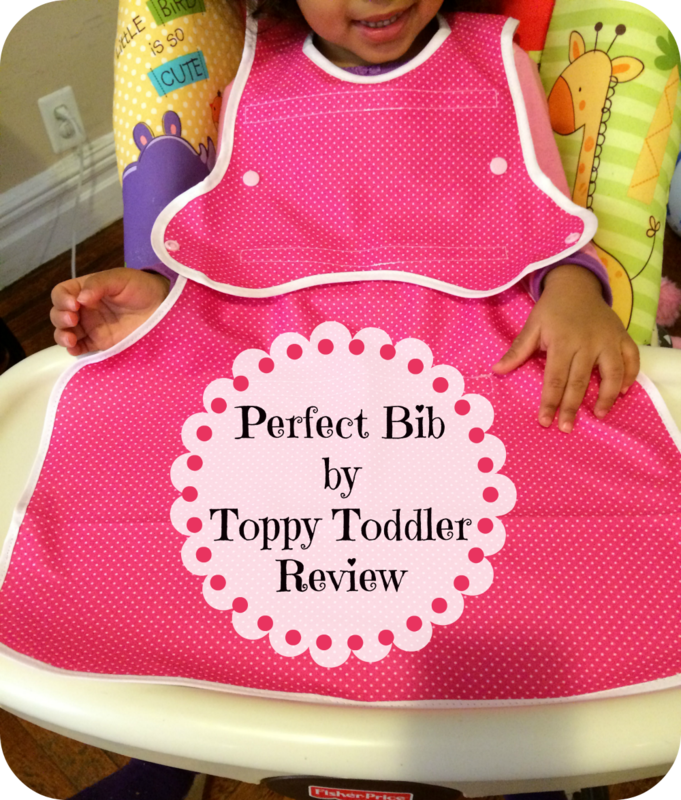 I was so excited to get to review the Perfect Bib by Toppy Toddler. My daughter has become super independent with her meals and makes a huge mess. The Perfect Bib came to the rescue as it is large enough to cover her chest and the high chair tray! When I first got the bib I loved how light and soft it was. It also comes in other bright colors and cool prints. It has two parts that you can use apart or together. The top bib part has special snaps that turns into a bib with a pocket that catches spills and crumbs. 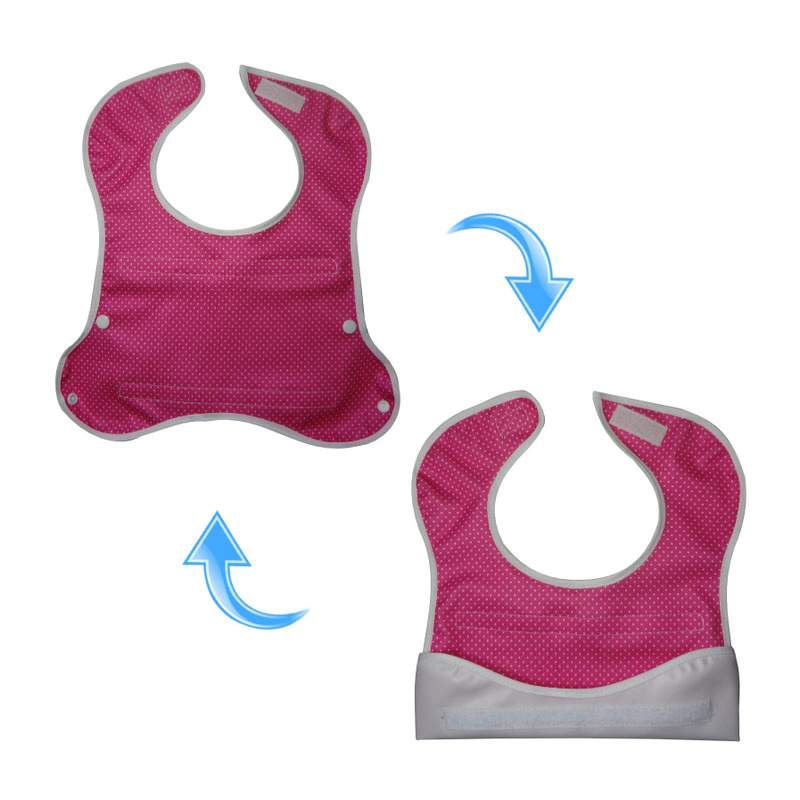 The bottom mat part can be used as an eating mat or even a changing pad. Together it can be used as a complete cover in a highchair, smock or even superhero cape! My favorite way to use the Perfect bib was as a complete highchair cover while she eats messy things like cereal and yogurt. I love that the mat part covers the whole tray. 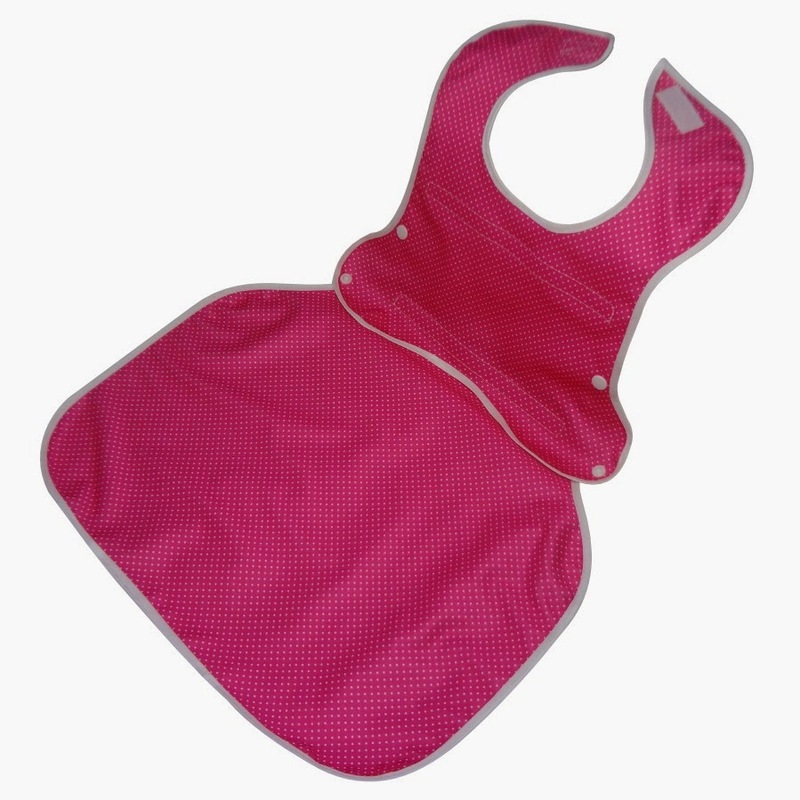 The connection of the bib and mat also prevents spills and messes from falling into the lap. The Perfect Bib can be purchased at http://perfectbib.com/ with free shipping! pretty cool I might buy one for my grandson! Wow - cool product! Wish this was around when my kids were little! I like the idea and the color is so pretty. I like that it covers nearly all their front shirt. Such a cute looking bib! This would be great also for wearing while eating out as it would keep clothes from getting soiled! I guess that would make clean up super easy, cause we all know how messy babies can be when they eat. That is a great bib, wish we had these when my kids where babies. I wish they'd had these when my kids were little! My husband would probably say I could still use it now, though. I like how versatile this bib is, and the color is really fun too. This bib would be perfect for my son! This would be perfect for my youngest, we're slowly starting solids since she's showing interest! Oh my goodness those are so cool. I love how you can add the attachment to lengthen the coverage so baby's clothes don't get covered. Now if only they had one for the floor. hehee! Great idea for the bib. I never understood the short little ones! This bib looks great, just the right size to catch all those food spills. Thanks for sharing. Also, great for grandparents, we did this once to my grandpa - he laughed. I think its great, sometimes food fall down into the lap and well its lost, but this prevents it. Only draw back I'd see is more laundry, unless it wipe off, then it really is the perfect bib. It's About Time They Made A Bigger Bid I Love It! Thanks For The Giveaway!! That bib looks incredible! What a great way to keep your kid as covered as possible while eating. It seems like such a great help for mommies as it keeps the mess at bay. And I love that it's made of 2 parts so it can be used for babies and toddlers. Hum--I know some adults who could use this--especially when they are eating a whole lobster or a plate of pasta! I am really good with lobster--now as for pasta-----how does that red sauce always end up on the front of my blouse? I love it!! My daughter could REALLY use such a thing! I'd enter your giveaway if I was in the states! Wow! Great bib! That will sure make clean up a breeze! This really is great. I love that it's long enough that it covers so much! I have though, just past this stage with my toddler, but this would be a really great gift! This is really perfect when it comes to its usage and it appears to be apron already. I wish I would have had this bib when my kids were small. They were always SO messy! How creative! Why didn't they have this when mine were babies?! Yeayah no more messy babies !! i wish these were around when my kiddos were little ! !